At 26 years old, the last thing in the world I ever thought I would become was an alcoholic. To me, an alcoholic was a retired business individual, not a 26-year-old college graduate. But I was, and it was a devastating fact to face. When I was finally ready to get help, my mother found the Hanley Center. I was welcomed with open arms, and for the first time in what felt like forever, I found individuals like me. Through Hanley’s comprehensive approach at the 12 Steps of recovery combined with intensive therapeutic approaches – I was able to recover. I have found the tools necessary to deal with life on life’s terms. Since leaving Hanley, I have gained meaningful employment, am finishing my first year of graduate school, and continue to work and give back to other alcoholics who seek the same solution. I have found that, without the Hanley Center, my life would be over. 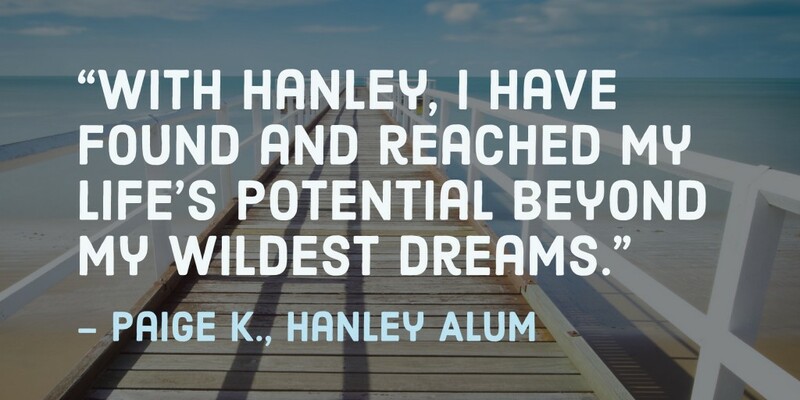 With Hanley, I have found and reached my life’s potential beyond my wildest dreams. Thank God for the Hanley Center!